The People Gallery shows friends, volunteers, staff and others who have contributed to the development of the archive. 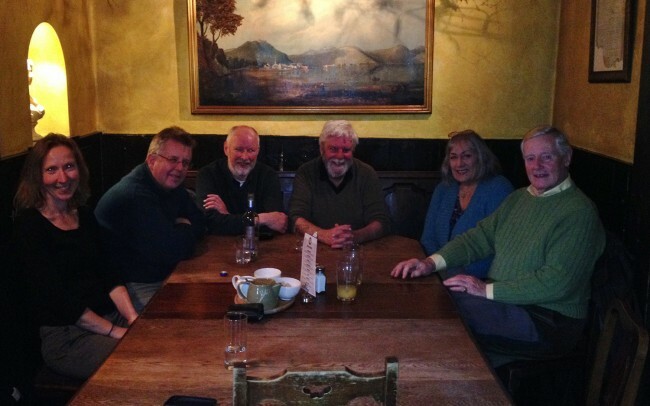 Friends of the Argyll Papers founding committee at the inaugural meeting in Inveraray, December 2014. Left to right: Ishbel MacKinnon (Argyll Papers archivist), Allan Macinnes, Murdo MacDonald (Chair), Duncan Beaton, Ann Galliard, Diarmid Campbell (Secretary). Ronnie Black and Annie Tindley (Treasurer) are missing from the group. 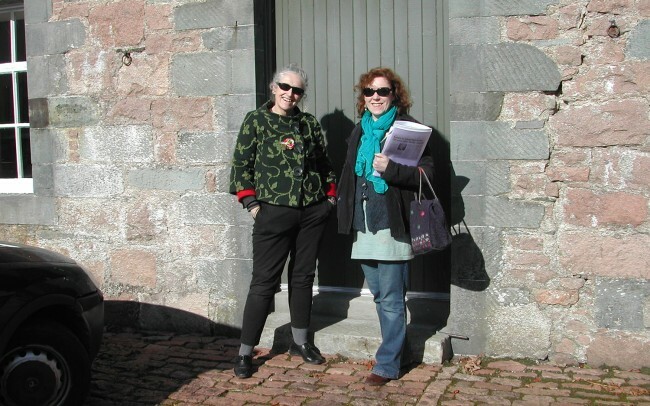 Linda Ramsay, Head Conservator, National Records of Scotland, and Alison Rosie, Registrar, National Register of Archives for Scotland, Cherry Park, October 2013. Linda and Alison have been involved with the archive for many years, giving valuable help and advice about cataloguing and conservation. Baliscate Chapel Research Group and Claire Ellis, of Argyll Archaeology, looking at maps and estate records, October 2012. Left to right: Claire Ellis, Hylda Marsh, Bill Marsh, Jean Whittaker, Olive Brown. Members of Mull Museum found an early medieval chapel at Baliscate, Tobermory, in 2007 and it has been the subject of intense interest since, including a Time Team Excavation in 2010. The Argyll Papers have helped to develop a better understanding of the historic landscape around the chapel. Ronnie and Maire Black photographing the Dewar Manuscripts using spoons (!) summer 2013. The Dewar Manuscripts is one of Scotland’s most important collections of Gaelic historical tales. 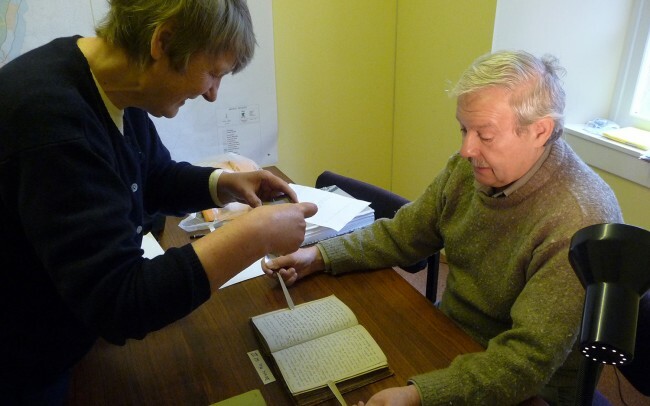 Ronnie, a retired Gaelic scholar and writer, is cataloguing the collection (seven volumes) and transcribing them as a long term volunteering project. 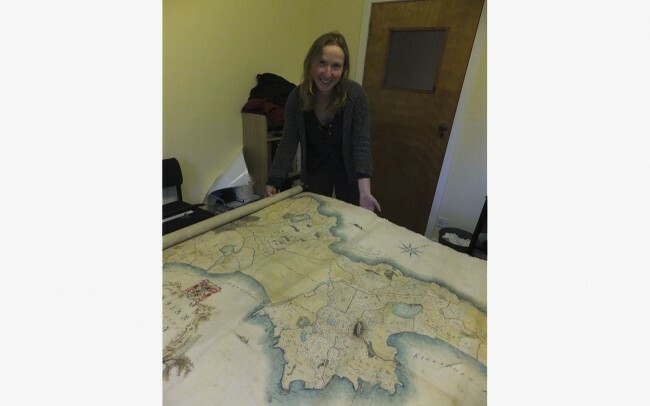 Ishbel MacKinnon, Argyll Papers archivist, unrolling James Turnbull’s Survey of Tiree, 1769. Ishbel is a professional archivist and has been employed part-time since summer 2012. She has undertaken a stock-check and condition survey of the archive, building and storage improvements (on-going), and is developing cataloguing and conservation plans, research services and funding applications. 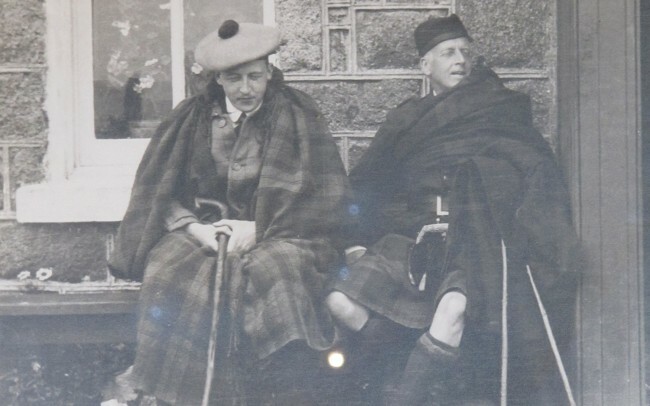 Niall Diarmid, 10th Duke of Argyll, with his father, Lord Archibald Campbell, at Inveraray Castle, c1910. Duke Niall was a keen antiquarian and family historian and transcribed many important, early records in the archive. His transcripts ‘The Argyll Transcripts’ have become a valuable resource for generations of historians. 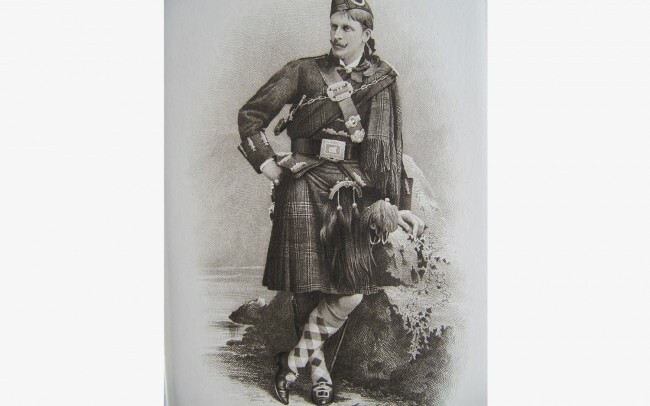 Lord Archibald Campbell (1846-1913) in Highland Dress. Lord Archie was a keen antiquarian and published several books on Celtic folklore and Highland arms. He was also a talented artist and caricaturist. His personal papers which are held in the archive form an eclectic and interesting collection – see our For Fun Gallery for some examples!